Though the exact beginnings of the Cubano are unknown, the pressed sandwich of roast pork, ham, cheese and pickles on Cuban bread is usually associated with Miami, where it arrived from Cuba by way of Ybor City cigar factories and Key West. The sandwich’s appearance in Tallahassee is less mysterious and much more recent. Eddie Agramonte came to Tallahassee for school from his hometown of Hialeah and noticed there weren’t any Cuban restaurants in town. He opened Gordos Cuban Food in 1996 at 28 years old. “Gordos was a pretty standard Cuban restaurant when we started. There were six sandwiches and black beans and rice. As time went on, we became more mainstream with some of the menu, but we still keep the flavor and flair of Cuban food,” Agramonte said. He now operates Gordos Cuban Cuisine in two locations: the original Pensacola Street restaurant that feeds the college community and a family-oriented Gordos that opened five years ago in Market Square. Agramonte also owns Bandidos Burrito Company, which serves Tex-Mex food near campus. He just opened a sports pub, Bumpa’s Local 349, on Capital Circle Northeast. Since its early days, Gordos’ menu has expanded to include Cuban classics, such as croquetas, picadillo, pollo a la plancha, and palomilla, as well as “mainstream” burgers and wraps. The restaurant’s owner wants Gordos to be able to cater to different tastes. Agramonte’s favorite dish is masitas de puerco. “Pieces of pork are cut into 2-inch cubes, then they’re simmered with limes and lemons, and then deep fried for about a minute. They get crisp on the outside, they’re so tender. That’s why they’re my favorite — they’re delicious,” he said. Asked what makes a Cuban dish “authentic,” Agramonte acknowledged that everyone will answer this question differently. On a Friday afternoon at the end of the fall semester, students and their parents filled the Pensacola Street Gordos for lunch. Like many college hangouts, Gordos has a beach theme, the walls hung with surfboards and strung with Christmas lights. The restaurant was cozy, with several small rooms and a large outdoor deck, the sound of traffic in the distance. Every table throughout the restaurant was dotted with several Gordos cups, plastic cups printed with the restaurant logo, which includes the face of a mustachioed man in a chef’s cap. Patrons who order a Smash, Gordos’ signature rum punch, get to take their cup home once they’ve finished their drink. I ordered a Cubano — flavorful, gooey and tangy — and a side of black beans and rice. On a tip from a friend, I asked for a side of Gordos sauce, a mayonnaise-based dressing, for my sandwich. It turned out to be more than enough food for one person, at a very reasonable price. 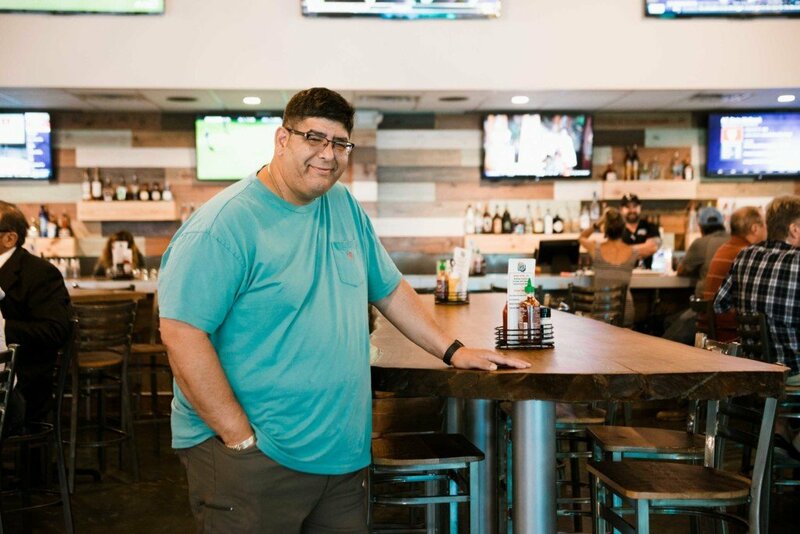 In January, Agramonte opened Bumpa’s Local 349 in the old Calico Jack’s location — a sports pub, he said, but geared to be as appealing to women as it is for men, who often make up the bulk of a sports bar’s customer base. “I want to have comfort food you want to go eat. Fish tacos, ahi tuna, the best salads in town. I go where my wife and kids want to eat, where my mother wants to eat. I want her to want to go to Bumpa’s.” Who is Gordo? Staring at my Gordos cup in the Pensacola Street restaurant, I realized I’d forgotten to ask. It means ‘fat guy’ in Spanish, Agramonte said.